The IDP Wise CXD80 Retransfer ID card printer is a reliable solution to print highly-secure cards and badges on the spot. Retransfer technology guarantees over-the-edge printing for superior print quality and maximum card security. With up to 40 seconds per card (YMCK), the IDP Wise CXD80 Retransfer printer will issue all your cards fast. Build the printer that you need with a single or dual sided printing module. Add a laminator to create secure cards and reduce the risk of counterfeiting and tampering. Optional advanced capabilities include Magnetic and Smart encoding, and Ethernet connectivity. 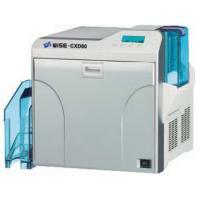 The IDP Wise CXD80 Retransfer ID card printer features a 2-year warranty. Reliable and affordable, the Wise CXD80 is the perfect choice to produce stunning badges for less! WHAT ARE THE MAIN SPECIFICATIONS OF THE IDP WISE CXD80 ID CARD PRINTERS? The IDP Wise CXD80 ID card printers are feature-packed to print secure badges. WHICH OPTIONAL FEATURES CAN I ADD TO MY IDP WISE CXD80 ID CARD PRINTER? The IDP Wise CXD80 ID card printers offer optional upgrades to adapt to your needs. WHICH TYPE OF CARDS CAN I PRINT WITH THE IDP WISE CXD80 ID CARD PRINTERS? Corporate: print secure ID cards for your employees and identify at a glance every person who belongs in your facility. Education: laminated student IDs will help secure your school and control access to your premises. Government: issue drivers� licenses, voter IDs, first responder cards or secure IDs for government officials, employees and contractors. Transportation: print secure badges for all workers of airports and ports to increase security. Healthcare: identify your patients, doctors and staff with laminated ID cards for extra durability. Payment cards: Issue secure payment cards, gift cards, or IDs with cashless payment options.